I really ought to just clip out the two sentence requirement because I can't ever, ever, ever share two sentences. 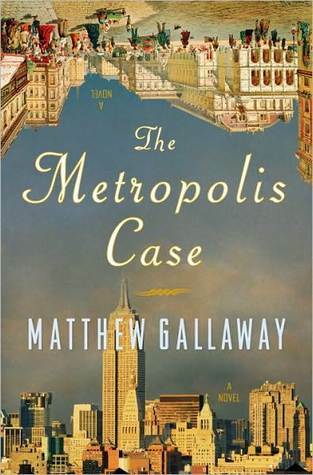 Anyway, this week's teaser is from The Metropolis Case by Matthew Gallaway. The cover is really quite striking and being an opera fan, the premise very much excites me. Also, as it's threatening snow in Boston, this opening scene resonated -- so here's your teaser! Edited to add: HA, snowing now! It had been snowing for days, but a sallow, expectant glow emanating from the crenellated perimeter of the park told her the storm was nearing an end. While she did not relish the thought of negotiating a trip downtown, the transformation of the city into a tundra, with squalls of powder and amorphous mounds where there had once been cars, mailboxes, and shrubs, struck her as the perfect accompaniment to the magic, improbable turn the day had taken, now that she was about to make her Isolde debut at the Metropolitan Opera. That's a pretty teaser! Love the cover of this one. This week my teaser is from The Iron Queen. Great teaser! Mine comes from ROOM by Emma Donoghue this week. Here's the link. This looks like a fascinating book! I love the cover. Nice teaser. Mine is at The Crowded Leaf. All: The book reads very prettily, too, and I mean that in a good way. There are about four storylines but each one is v clear and easy to follow -- plus, a good portion of the story is set in a Pittsburgh suburb where I spent my formative teenage years, so it's quite a blast to 'revisit', so to speak! @Lady Q: I've been dying to read the Iron books! @LitWitch: I heart Donoghue so much! @Alayne: I know, right? Last night I took the red home and as usual, was baffled by the delays since snow in Boston isn't anything new! @Gautami: Thx for stopping by -- I'll head over to see your teaser now! Great teaser! Don't sweat it about the sentence limit, I can never stick to it either :D You can find my teaser at The Bookish Snob Merry Christmas! I try and stick to the limit but fail too, I think its nice to see a bit more. makes it more interesting. ok, i'm sufficiently teased. love the cover! has an "inception" feel to it. on my must read list.